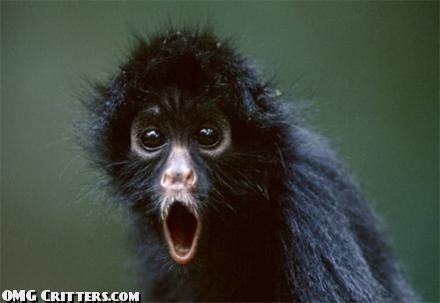 Was That a Screeching Brazilian Stink Monkey? A fear that creeps upon me and slowly overwhelms me. A fear that causes me to lay awake at night, tossing, turning, afraid to fall asleep for fear of might happen while I’m slumbering. What is this fear that has me in such a state of paranoia? I fear that a roving horde of screeching Brazilian stink monkeys will break into my home and handle all my possessions with their filthy stink monkey paws. I fear that they will rub my possessions all over their parasite infested bodies and then return them to their exact position of origin, leaving me to only guess of their nefarious activities. My friends tell that I’m crazy. Am I crazy. Am I really? When I get up in the morning, I find everything in exactly the same position that I left it the night before! Typical screeching Brazilian stink monkey behavior. Monkeys tend not to be fastidious creatures and are far more likely to scatter things about and pee on them, than return them to their place of origin. According to National Geographic, 1,200 new species of plants and vertebrates were discovered in the Amazon between the years 1999 and 2009 alone. With that many new species being discovered, one of them is bound to be a monkey, a monkey that by its sheer characteristics and nature, could only be called a Screeching Brazilian Stink Monkey. Itchy rashes shaped like Lake Titicaca. The inability to say Lake Titicaca without giggling uncontrollably. Your left ear will fall off at really inconvenient times. Squirrels will steal your mail. The theme to Gilligan’s Island will get stuck in your head. Everything seems to be going well; I sometimes get nauseous when I have to chase squirrels or bend over to pick up my ear. But now and then, out of the corner of my eye, I think I see a screeching Brazilian stink monkey, just waiting to handle all of my possessions. That red line is particularly itchy.